When I was growing up, I had no interest in playing with guns. I think at one point I asked for a toy gun because it seemed transgressive. My parents complied, generally without comment, and I lost interest quickly. An older mentor once told me that she had raised her son not to play with guns and he became a police officer; so much for that, she shrugged. 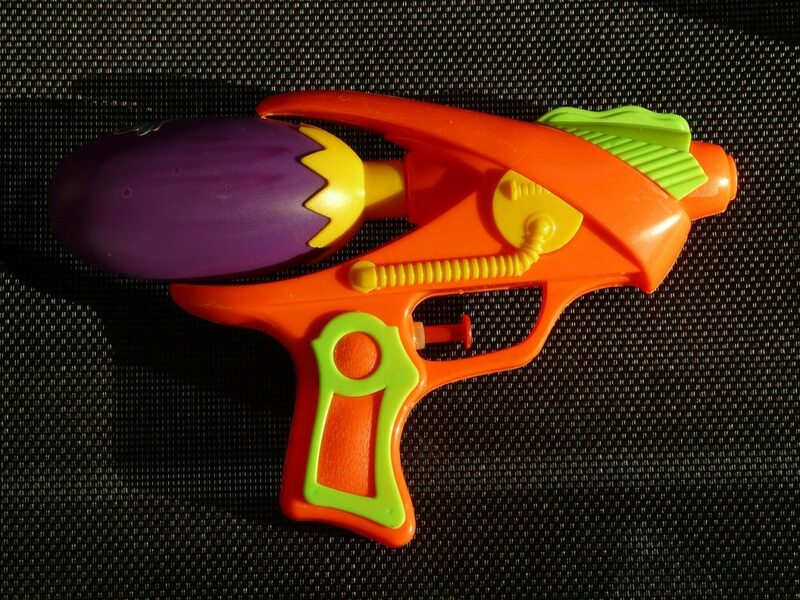 My own kids have faced a gun ban their entire lives; squirt guns are allowed as long as they don’t look like “real” guns. Nerf guns are not allowed: no solid projectiles. I’m a pacifist; I don’t believe people should have access to weapons that hurt for the sake of suffering, and don’t want to be part of glamorizing any kind of violence. War isn’t a game; it’s a sin. A month after the Parkland school shooting, 20 years after Columbine, it is a wearying world. I am not in and of itself, opposed to foam. But where to draw the line? If the guns don’t come into the house, is my son allowed to have his birthday party at a nerf gun arena? What about laser tag, when it’s not an actual projectile? When does harsh regulation backfire? Even our language is full of the imagery. I long for logical consistency here, but there just isn’t any. We live in Western Pennsylvania, and guns are part of life. If a trusted friend’s family invited one of my kids to go hunting, I would consider saying yes; we aren’t vegetarians. Meat comes from somewhere, and farming is not more gentle. Still, we’re sticking by our at-home guns ban. Toy guns simulate killing people, not deer. This feels like a clear-cut Sermon on the Mount occasion: love your enemies. No violence. These are the big moral principles that guide us. In the course of my travels as a parent, on this one, I’m also finding my Scriptural precedent in a place I wouldn’t initially have thought to look: the book of Numbers. The officials of Moab want Balaam, a prophet for hire, to curse the Israelites. Balaam knows God doesn’t want him to go, but he’s also afraid of refusing the Moabites, who keep bringing more and more powerful officials to get Balaam to come with them. Finally, God says, “Ok, go with them, but do what I tell you to do.” Balaam relents and goes ahead. God sends an angel. The NRSV translation renders it this way: “God’s anger was kindled because he was going, and the angel of the LORD took his stand in the road as his adversary.” (Num 22: 22). Balaam hits his donkey to go to the left, to the right, frontwards, backwards. No matter where, the angel blocks the donkey until Balaam figures it out (in one of the weirder stories of Scripture, the donkey talks—only it can see the angel at first). I can’t close off all opportunities for my kids to interact with weaponry, but I do want to be enough of a roadblock about it to convince them to think a little more deeply. I don’t want them to take violence for granted. I could keep them home all the time and cut off all their friends and all their video games (tempting!). But I want them connected, and free, and learning to make their own choices. The world “out there” is not some a distant, adult projection. It’s my kids’ world, too. They live in it. As the students in Parkland, Florida are rightly calling out legislators for claiming nothing can be done, my kids, too, will make their own decisions about how to engage as they set out on their own. As I share our Christian faith with them, I pray they bring the Sermon on the Mount with them as they go. And when all else fails, let’s hope God’s holy adversaries and angels accompany them on the way. What’s your approach to toy guns at home? We are a no gun household – nothing with trigger has been our rule since our kids were toddlers. Yes, they turned things into guns as preschoolers from sticks, bread to pieces of paper cut into triangles. But as parents, we held firm. It took a lot of reinforcement and explanation when they were younger, but now my kids (9&6) understand that our family’s rules are just different than other families’ rules. As Christians, we strive for peace. As Christians, we respect the dignity of every human being. We are not living into these baptismal promises, if we are aiming a gun at fellow children of God. “Toy” and “gun” is a contradiction in terms. I do not have children, but am a retired teacher. In my former school, there was a Spring “ritual” called “Killer,” which was played by the upper-termers. Armed with toy guns, players (all of whom had to put money into the “pot”) had to stake out their prey from the opposing side, stalk them, and shoot them, thus eliminating that opponent. The game took place after school, usually, but could go way into the night, often going into other neighborhoods to stalk and “kill” opponents. One encounter occurred in a subway station, and a student’s gun looked so realistic, that a police officer mistook him for an actual assailant, and wrestled him to the floor. Whenever I think back to that time, it brings into high relief that sometimes our harmless “games” can have lethal (near-lethal) consequences. Thank you, Rev. Irwin for your strong and honest article on this issue. Hello, and thanks for sharing this post. I am an Episcopal priest and father of four children. I draw a strong distinction between firearms and violence for my children. All of them have been taught how to use a bow and arrow. My sons, the oldest, have been taught how to use a firearm and we teach gun safety in our home. As my daughters come of age they will have time at the range, too. A firearm is tool – nothing more or less. I teach non-reactive behavior. Violence comes in many forms – language, use of social media, demonizing politics, economic practices, etc. Sometimes violence is used to degrade and to destroy. I teach against that usage of violence. I teach my children to be thoughtful about their choices and to accept the responsibility for their actions. Sometimes violence is used to protect and to serve. I am not a pacifist, nor do I believe that such a position is a sine-qua-non of the Judeo-Christian faith. I believe the thoughtful use of firearms is legitimate and, in some cases, quite necessary if one is to support the dignity of every human being. Thank you Sara. I, too, do not allow my kids to participate in the gun culture. You scripture suggestion will be with me always. Peace and protection to you and yours.